a heart surrendered: Marriage shows us our sin - and I possess more than I care to admit. Marriage shows us our sin - and I possess more than I care to admit. We have never used books as the centerpiece for premarital counseling with young couples, but that is going to change. This is a 'must read' for couples who want to say, "I do." Gary Thomas looks at marriage from all angles, speaks honestly about the realities and difficulties of married life, and boldly challenges couples to look at marriage through the lens of eternity and holiness rather than through the lens of selfishness and ease. My friend Jill and I have worked our way through nine chapters, and both of us agree that no matter how long you have been married, there is always effort to be made because sin is always present. And we often choose to deal with sin the wrong way. We allow it to poison our relationship with our spouse instead of propelling us towards Christ. Dennis and I know this first hand. We will celebrate 24 years of marriage in July, but we would look anyone straight in the eye and admit that we have only enjoyed about twelve years of a GOOD marriage. How we struggled and fought and served ourselves instead of serving one another in the beginning! It is only because of God's grace that we are together -faithful and committed until death parts us. The title: "The Cleansing of Marriage - How Marriage Exposes Our Sin"
Typing out the entire chapter would be best, but in the interest of time, I will share the statements and thoughts that convicted me most. ➙ Marriage certainly has its challenges, but when these are faced head-on, our marriages can nurture our devotional lives in enriching ways. One of the ways is by unmasking our sin and our hurtful attitudes and thus leading us into a spirit of humility. ➙ A husband who truly loves his wife will want to see her grow in Christlike purity. A wife who truly loves her husband will want to see him grow in godliness. Out of true love, both will put growth in godliness above affluence, public opinion, or personal ease. ➙ This presupposes, of course, that I'm willing to be confronted with my sin - that I'm willing to ask my wife, "Where do you see unholiness in my life? I want to know about it. I want to change it." This takes tremendous courage ... It means I'm willing to hear what displeases Lisa about me, as well as to refuse to become paralyzed by the fear that she will love me less or leave me because the sin in me is being exposed. 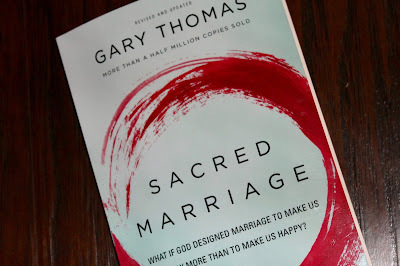 ➙ I believe it is possible to enter marriage with a view to being cleansed spiritually, if, that is, we do so with a willingness to embrace marriage as a spiritual discipline. To do this, we must not enter marriage predominantly to be fulfilled, emotionally satisfied, or romantically charged, but rather to become more like Jesus Christ. We must embrace the reality of having our flaws exposed to our partner and thereby having them exposed to us as well. Sin never seems quite as shocking when it is known only to us; when we see how it looks or sounds to another, it is magnified ten times over. ➙ Behind virtually every case of marital dissatisfaction lies unrepented sin. Sin, wrong attitudes, and personal failures that are not dealt with slowly erode the relationship, assaulting and eventually erasing the once lofty promises made in the throes of an earlier (and less polluted) passion. ➙ ... I wouldn't be surprised if many marriages end in divorce largely because one or both partners are running from their own revealed weaknesses as much as they are running from something they can't tolerate in their spouse. ➙ View marriage as an entryway into sanctification - as a relationship that will reveal your sinful behaviors and attitudes and give you the opportunity to address them before the Lord. But here's the challenge: Don't give in to the temptation to resent your partner as your own weaknesses are revealed. Don't run from what you are hearing about yourself, or push your spouse away because of it - accept it and use it to grow. ➙ Much of our marital dissatisfaction comes from self-hatred. We don't like what we've done or become. We've let selfish and sinful attitudes poison our thoughts and lead us into shameful behaviors, and suddenly all we want is out. How ironic (or embarrassing) that less than an hour after finishing this chapter, I got into a fight. With Dennis. As I listened to my ugly tone and felt my anger, I remembered all of these quotes. But like Cain, who did not rule over the sin that was crouching at his door, I did not close my lips until it was too late. And Dennis was the first to apologize and ask for forgiveness. Lord, how much I have to learn! Make me a woman who loves Dennis more than I love myself, and please, let me see our marriage in the light of eternity rather than the frustrations of the present.